Diameter tape rules, diameter tapes, tree tapes, wrap around tapes, measuring tapes, measuring tape rules. Additional regular, linear tape rules are shown on our Tape rules, regular page. Additional hand tools are listed on the Hand tools page. Diameter tape rules are designed to measure both the diameter and circumference of circular tanks, pipes, cables, etc. The diameter side of the tape rule blade is graduated to show diameter inches. The back side of the blade is graduated to show standard linear measurements, just like a regular tape rule. This linear measurement is the circumference of a round object. Conversion from diameter to circumference is made simply by turning the blade. Zero falls on same place on each side of blade. Polished chrome case. Spring action returns steel blade to case. Linear side of both tapes below is consecutive inches with 1/16" graduations. The first 12" are also marked with 1/32" graduations. Both blades are 1/4" wide. 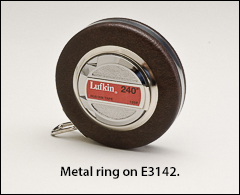 Diameter side of the E3140 is graduated into diameter inches by 1/64". 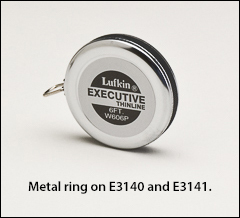 Diameter side of the E3141 is graduated into diameter inches by 1/100". Rugged vinyl-covered steel case. Easy action winding drum. 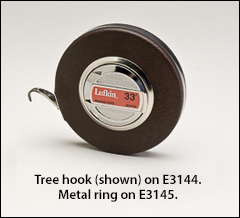 A nylon roller guides the steel tape blade smoothly in and out of case. Blade is 3/8" wide and 0.008" thick. Linear side of tape is consecutive inches with 1/16" graduations. Diameter side is graduated in diameter inches sub-divided to 1/64". Durable vinyl, covered steel case. Easy action winding drum. Nylon rollers guide steel tape blade smoothly in and out of case. 3/8" wide blades. Linear side of both tapes are marked in feet and inches with 1/8" graduations. Diameter side is marked in diameter inches, feet, and 1/64" graduations.